Everything that’s wrong in your life is the fault of your parents. Whatever your struggles, your mistakes and your pain, you are not to blame. You are an innocent victim of those who raised you. At least that’s the way some folks interpret my definition of Childhood Emotional Neglect (CEN). The definition of CEN: A parent’s failure to respond enough to the child’s emotional needs. People who grow up this way go forward into adulthood out of touch with their own emotions, feeling empty, alone and disconnected, and are baffled about what is wrong with them. Are you saying that when a parent fails to teach their children this skill well enough, that parent is guilty of Childhood Emotional Neglect? This article was insulting. I’ve received many such comments. They point to one of the biggest barriers I have encountered in my efforts to bring the concept of Childhood Emotional Neglect to more people: the discomfort of blaming the parents. As a psychologist, a parent and a daughter, I truly understand this discomfort on multiple levels. The concept of blame weighs heavily upon us all. If we blame our parents, then perhaps we will feel less burden of blame upon ourselves. But is this a way of letting ourselves off the hook for taking responsibility for our own choices and behavior? And won’t we then have to feel guilty, and take the blame for how we have parented our own children? It is a Win/Lose situation at best; and a Lose/Lose situation at worst. So what is the answer? Who is at fault for our adult struggles, mistakes and issues? Do our parents get a free pass? What if our parents were well-meaning? What if we have made mistakes with our own children? Are we to blame for that? What is the answer? Remove blame from the equation. Instead, focus upon understanding your parents’ effects upon you and taking accountability for your own decisions, mistakes and choices. Unless your parents were unloving, uncaring or abusive, blame is a useless concept. It is a road that takes you directly to Nowhere. Blame is not healing and it is not helpful. However, it is worthwhile to try to understand how your childhood affects you. Understanding is crucial to being able to have compassion for yourself and to conquering your adult struggles. You can have an understanding of how your parents’ mistakes affected or hurt you without going down that Blame Road to Nowhere. Once you see how your childhood affected you, you are freed up to hold yourself accountable as an adult. You, the adult, are responsible for your own decisions, mistakes, and choices. Own them. Be accountable for them. Learn from them, and move forward. No blame or guilt necessary. I think that we would all be much healthier and happier if we would let go of this obsession with blame, realize that yes, each and every human being has a childhood living within him which has a profound effect upon who he is as an adult. Understanding your childhood does not absolve you of responsibility for your adult life. Instead, it frees you up to take responsibility for your adult life. Yes, there are complex interactions between genetics, environment and parenting which are yet to be discovered. But the true power of parents is not one of them. It is a known, highly studied and highly proven fact. And the better we embrace it and use it to our advantage, with a focus on understanding and accountability and less on blame, the happier and healthier we will be. 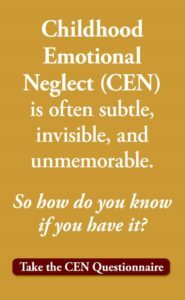 To learn more about CEN, Take The Childhood Emotional Neglect Test. It’s free. A vitally important clarification for approaching the CEN topic with family members without a doubt. 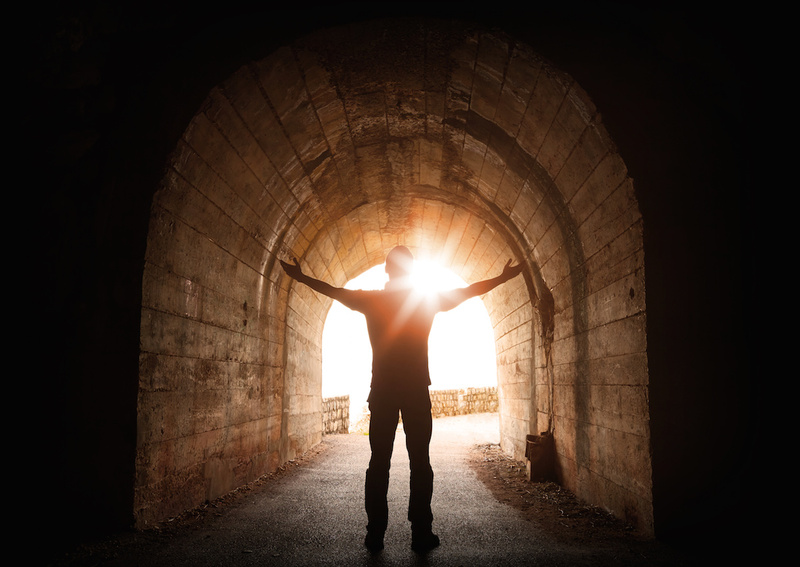 Dr. M.Scott Peck considered the most courageous disclosures in psychotherapy to be ‘My parents did not love me.’ and ‘I do not love my children.’ Accepting the notion of CEN requires that level of courage for many. I wonder if being able to consider parental behaviors and influences as purely objective ‘stimuli’ and the biological and psychological impacts as ‘responses’ would help reduce the ‘willing blindness’ some tend to adopt as a defense to any differing point of view. Feeling safe enough to keep our emotions at bay has been a high-wire walk, on both sides of the conversation, in my own experience, but well-worth the commitment. Dear Craig, I agree that it takes great courage to face and accept Emotional Neglect. Thank you!